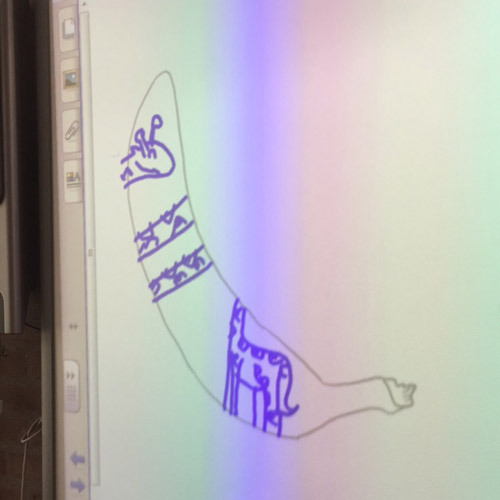 Elementary school ‘De Ark’ in Elst (The Netherlands) invited me to give a banana art workshop. I chose to use one of my most famous designs for this; The Giraffe. To prepare the workshop I broke up the proces in tiny baby steps and produced a handout so everybody had clear sight about what we where going to do. Before starting I introduced myself and answered some questions from the students. Like if I ever drew a banana on a banana (I did!). We then started to draw. The students on the bananas and me on the smart board to guide them through the proces. Showing them precisely what to draw where. Teacher Bas was very impressed that everyone was focused and kept focused during the whole process. That’s the power of potassium!